On a mild late summer’s evening the atmosphere at Sydney’s outdoor Football Stadium is electric. In the descending darkness, 28,000 fans clutching oversized programs file to their seats on the field before, and in stands around, the huge stage at the southern end. The buzz of excitement is tangible. Much has been made of record-breaking ticket prices, a no-expense-spared set, the battalion of technicians, riggers, musicians and singers required to mount the production with its state-of-the-art sound and lighting systems. Anticipation, already at fever-pitch, is further heightened by the show's 24-hour delay due to rain. Can one performance live up to the sky-high expectations engendered by such hype? Can any one artist really be that good? At 8.30pm the stadium lights dim and all eyes focus on the spotlit stage as Marvin Hamlisch raises his baton. The familiar strains of the overture, so well-known and loved from the US ’94 concerts, fill the arena, and 28,000 spines tingle in unison. Enter Brother Time, tonight renamed Time Wizard and played by Australian Kip Gamblin, substituting modern dance for Savion Glover’s tap routine, as the ticking, exploding, whirling clock video sequence is played out on the giant screen above him. Reprising their Las Vegas roles, Alec Ledd, Randee Heller and young Lauren Frost reproduce the Nola Studios recording session of "You’ll Never Know." When Time Wizard reappears, back to the audience and black cloak swirling, no one is in any doubt as to what will happen next. From behind a flourish of black cape, to a roar from the crowd and a standing ovation, Barbra Streisand steps for the first time ever onto an Australian stage. On its feet, fibre-optic torches waving, the audience cheers its welcome, the first notes from that unmistakable voice barely audible above the din. "Something’s coming, I don’t know what it is, but it is gonna be great." Sydney knows it, and in a split second thousands of life-long ambitions are fulfilled. During the performance, Barbra recounts that her first proposed visit to Australia was to have been 25 years ago for the opening of A Star is Born. An ear infection barred her from flying, and it has taken 25 years for her to fulfill her own ambition — to thank her Australian fans for their years of support. "The only place I wanted to sing outside of the United States was your country," she confides, to a roar of approval from an audience that has waited so long to be here. She considers for a moment, then shrugs wryly. "Actually, it wasn't even a shlep to get here." From "The Way We Were," throughout which she interjects her thanks to the crowd for almost making it last night, and finally making it tonight, Barbra turns to the taped Shirley MacLaine Y1K piece which meets with an appreciative reception. Now she takes us back to Greenwich Village and her early nightclub appearances. "I don’t know if you know what Greenwich Village is like, but it’s like your Darlinghurst, I’m told. Lots of little clubs and bars." Familiar to fans through her early album versions, at last we hear "Cry Me a River" and the wonderfully jazzy, brassy "Lover Come Back to Me" live. The pace slows with "A Sleepin’ Bee." Barbra confesses to a hoarse voice thanks to two nights of long rehearsals in the cold night air and apologises that her voice is a little scratchy. "We love you anyway!" cries an audience member, and she laughs in appreciation. "Thanks, that’s nice." Possibly to conserve the voice, or perhaps because it was felt only the most devoted Streisand aficionados would be familiar with it, "Miss Marmelstein" is dropped from the Sydney show. 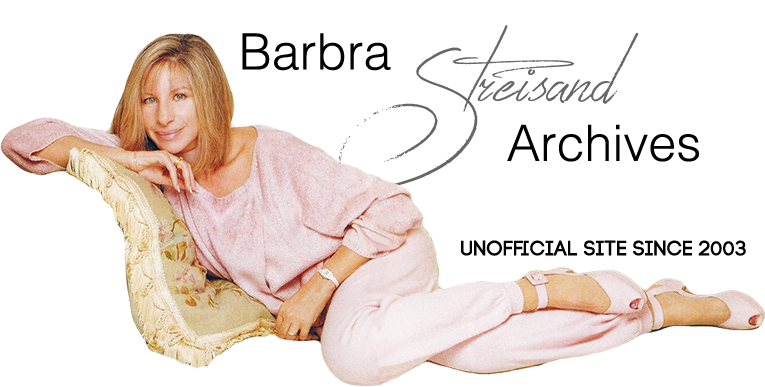 Instead, Barbra tells of her arrival here and of being greeted by a hotel clerk calling her "Bubra Strei-zund." Correcting the mispronunciation, and assuring us it happens to her everywhere, she moves on to the Funny Girl medley that brings the crowd to its feet again at the conclusion. In the earlier numbers, Barbra hasn’t attempted any soaring final notes, but has little problem sustaining the end of "Don’t Rain on My Parade." Throughout the night she has a lot of fun with the Australian accent and expressions. Notoriously difficult to imitate convincingly, the Aussie inflections in lesser hands usually sound Cockney, but Barbra’s ear is well-tuned. In four days she’s accumulated a battery of expressions to throw back at us, obviously enjoying our way of calling her "Bubra," our laid-back use of "No worries," and our pronunciation of "fourteen" as "fordeen" or "party" as "pahdy." From the magic of the "Something Wonderful/Being Alive" medley, Barbra turns to "As Time Goes By," and, minus the participation of Brother Time or the "Speak Low" verses, on to "Alfie." The audience loves her story about hearing it years later and wondering why she hadn’t recorded it, only to be told that it was her own version she’d been listening to. Songwriting "may not be my day job," as she says, but "Evergreen" is well-loved and well-received, before she recounts the touching story of finding her father’s letter 60 years after it was written. From the first notes of "Papa Can You Hear Me?" excitement fills the stadium. The gorgeous cross-over of this and "You’ll Never Know" is followed by the stunning "A Piece of Sky." It is obvious the audience has been hoping for a repeat of the ’94 concert’s duet, and the split-screen images of the film’s Yentl, Lauren Frost, and Barbra bring them to their feet once more, torches flashing and a massive burst of applause to conclude Act 1. The proposed one-hour interval is shortened to 20 minutes. As in Las Vegas, Act 2 opens with the Entr’acte and the spectacular "Putting It Together" video montage. Barbra returns in a flowing white gown and a sequin-studded wrap that she tells us is her wedding veil. After "On a Clear Day" (her voice strong and assured again after the break), she sits to sing the poignant "Send in the Clowns." Hair and wrap blowing softly in the wind, backlit by high spots, the moment is reminiscent of the images we’ve seen of her 1967 Central Park performance. Clearly reveling in the show’s theme of "looking back with fondness," the audience loves the video duet sequence ("Crying Time" has been cut). "Your own Barry Gibb!" Barbra points out and, as a murmur of recognition goes up at "You Don’t Bring Me Flowers," she asks "Remember that?" Popular, too, are the clips of Jason’s party and the clever black-and-white "duet" with Frank Sinatra. Now appearing very relaxed, Barbra plays with the "clicker" sequence and enjoys the crowd’s laughing responses. "You call these TV remotes, right? We call them clickers." When her mother rises from the floor, still berating loudly, Barbra struggles with the remote. "I need a mother clicker! Mute! Mute!" She shakes her head at the technology surrounding her on stage. "This video screen got more rehearsal time than I did, I can tell you!" Strangely, however, the piece is not followed by "Simple Pleasures," as in Las Vegas. Instead, three backing singers enter for "The Main Event/Fight," another number warmly appreciated by the crowd, particularly when Barbra joins the girls in a few dance steps. At its conclusion, Barbra introduces the girls, Natalie Miller, Lisa Edwards, and much-loved African-American singer (now Australian resident) Venetta Fields. Reunited after 25 years, Barbra and Venetta reminisce over the last time they worked together, when Venetta was one of the Oreos in A Star is Born. One line raises a huge laugh from the Sydney audience. Barbra calls the girls "Yentl As Anything," a play on the name of Australian band Mental As Anything. The audience obviously agrees with Barbra’s cheeky "Hello, Gorgeous" when husband James Brolin’s face appears on the video screen for her lovely rendition of "I’ve Dreamed of You." Joined by the Sydney Children’s Choir and Sydney Philharmonia Choir on the stage’s lower level for "At the Same Time," Barbra takes this moment at the song’s conclusion to thank her fellow singers and musicians, before moving on to "Auld Lang Syne." She asks the audience to sing along, in her "first duet in a foreign country," while she sings the "Friends" counter-melody. However, "Friends" does not receive its own stand-alone performance, but this is planned. One thing that isn't planned is Marvin Hamlisch missing Barbra’s slightly altered cue to him ("It's good to think about that.") at the end of her "At The Same Time" spoken intro. The orchestra remains silent, and Barbra gently prods, "Marvin, I said think about it." The music then begins, and she laughs it off, teasing, "He fell asleep." Both recovered from the awkward moment quickly. "We may be divided by oceans and continents," says Barbra, but we‘re all just "People, people who need people." Arguably the number most identified with her, "People" gains yet another enthusiastic ovation, as does "Happy Days are Here Again," which concludes the show. Returning from the opposite side of the stage for her encores, Barbra laughs "I just shlepped the whole way 'round there," then quiets the mood with "Don’t Like Goodbyes." "Sydney, we’ll miss you," she admits. Sensing the inevitable coming, the audience responds with prolonged applause and more waving torches to "I Believe" and the spine-tingling "Somewhere," on which Barbra is joined by Lauren Frost, and both are seen off the stage by the Time Wizard. After a few minutes, a renewed roar goes up as Barbra returns from stage right and turns to Hamlisch. "Marvin, you think we should do another song?" eliciting a roar of audience approval. "We didn't plan this," Barbra claims. "Okay, we'll take hands. You wanna hear 'Music That Makes Me Dance'?" Another roar of approval. Barbra confirms, "I think 'Music That Makes Me Dance'...I sang this for the first time in 1963, and now I have someone to sing it to, really." Waving her final thanks, Barbra exits for the last time, the orchestra playing her out with the stirring "People" theme. And the answer to the question — can one artist really be that good? Australians took Barbra Streisand to their hearts from the release of her first albums and the screenings of her earliest films. Unable to witness live performances, we satisfied ourselves with TV specials, movies, albums, One Voice and the ’94 concerts on video and CD. Never did we think — though we dreamed — that we would ever have the opportunity to do what we did last night — stand and applaud, on home soil, the one artist who really is that good. Credits: This review was written by Kim Hatherly, and was originally exclusive to The Barbra Streisand Music Guide website. It was written March 10, 2000, and revised 5/9/00. The newspaper clipping below was scanned by Anthony Lucca, from his collection. Barbra Streisand and her second night Sydney audience experienced a very special version of Timeless under rainy skies. Not only was Barbra's voice packed with more power than ever and near perfect the entire evening, but she also exuded extraordinary charm and humor, establishing a unique rapport with the somewhat uncomfortable audience for whom she continually expressed concern and appreciation ("Are you all okay?). Despite being rained on, the nearly full house was wildly enthusiastic from start to finish. Getting her first look at the poncho-covered audience, Barbra observed, "You look so cute, it looks like Halloween out there." She added, "I've been singing 'Don't Rain On My Parade' for 35 years, and it's worked up until now." Indeed, this was only one of Barbra's many rain-related ad libs, which began after her first line in "Something's Coming." Barbra's greeting: "Welcome to the Wet album - live!" During "The Way We Were" she remarked, "The rain doesn't affect the sound" and "It's good for the skin." Her Act 1 costume matched that of the previous evening while adding a matching wrap worn mainly near the end of this act when the damp winds kicked up. Barbra informed the crowd, "I haven't sung in a stadium since 1966. By the way, it rained then too. I came out in a yellow slicker with yellow galoshes. I was pregnant with my son Jason." While singing "Evergreen" downstage under the raindrops, she finally had to retreat backward, laughing with the audience in amazement and wonder at the unusual performing conditions. Barbra frequently thanked everyone for being so willing to sit in the rain, wondering at one point, "Is my hair beginning to curl?" In the midst of particularly heavy winds, she changed her "Papa, Can You Hear Me?" lyric from "The wind is so much colder" to "The wind is so much stronger." Hurrying her "A Piece of Sky" intro during a steady downpour, Barbra admitted, "Thank God, this is the last song of the first half." Returning to the stage after the "Putting It Together" video montage, Barbra wore a casual black outfit - the familiar turtleneck top from the "If You Ever Leave Me" music video, form-fitting sweat pants, and black sneakers, saying, "I thought that I'd be comfy, you know what I mean? They told me the stage was all wet, and I normally wear a white satin gown with a beautiful diamond necklace - I'll send you pictures. ...You don't mind, do you?" Pointing out her other wardrobe changes - adding an Australian outback-style brown Akubra hat and brown Driz-a-bone rain jacket - she said, "I love this hat" and then signaled the orchestra to launch into "Clear Day" - "So anyway, okay, Marvin, go!" Between song lyrics, she noted, "It's so easy to walk with sneakers!" and later added, "My outfit is by Speedo." Barbra's clever unscripted quips and ad libs, particularly those placed between lyrics in the middle of songs, are worth noting. In addition to those mentioned above, she said, in introducing "Alfie," "It was written by my friend Burt Bacharach, who also wrote 'Raindrops Keep Falling On My Head'." During "A Sleepin' Bee," after the line "Where you'll see a sun-up sky," she interjected, "I wish." Another "I wish" came just before beginning "On A Clear Day" and later in "Happy Days" ("The skies above are clear—I wish—again"). In "I Believe," after the lyric "I believe for every drop of rain that falls, a flower grows," she inserted, "There's always a positive to the negative." A rare lyric interjection in "People" occurred near the song's end, as Barbra sang the last line this way: "People who need people are the luckiest people (like me to have you here) in the world." In her cast and orchestra thank-yous, she remarked, "The strings don't even sound like they're going out of tune. Not bad." She surprised everyone with the very appropriate "Come Rain Or Come Shine" as a bonus encore (instead of "The Music That Makes Me Dance") with an arrangement similar to her original recording, magnified for the larger orchestra ("I hope I remember this, Marvin"). She absolutely wowed the wet but jubilant crowd with a sparkling rendition of a wonderful Harold Arlen song she hadn't sung in 20 years, exclaiming "Yeah!" in the middle and placing special emphasis with an added word on the last line - "I'm truly with you rain or shine." The song was subsequently issued as a limited edition bonus disc with the U.S. and Australian Timeless - Live In Concert CD set, available exclusively at Barnes & Noble and Sanity stores. B&N also provided the track as a free download at bn.com. Several fans consider this particular evening Barbra's best of the Timeless shows, largely due to her overflowing enthusiasm and spontaneity in less than ideal weather conditions. "I'll never forget you, Sydney," promised Barbra during her final bows. After the show, Australia's political elite, including Prime Minister John Howard, "fell over each other," according to one report, getting backstage to meet "Clinton's favorite singer." Credits: This review was written by Mark Iskowitz and Barbra Streisand Music Guide reporters in Australia. It was written March 13.